Wanhao’s 2017 Printer model now using DLP technology. 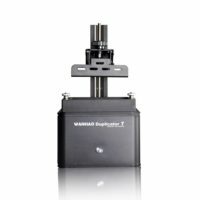 Wanhao’s 2017 Printer model now using DLP technology. Digital Light Projection is simply a screen projecting UV light in the shape of the layer that needs to be created. This light hardens the resin, and the object is pulled from this bath of liquid resin. 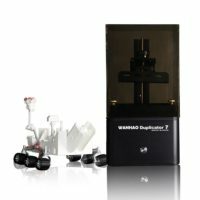 The Duplicator 7 3D Printer makes use of high resolution Digital Light Projection to cure a UV sensitive liquid resin material. Materials are all fully open source. This allows for extremely high resolution 3D printing of small objects at high speed. Please note, the Duplicator 7 is a very specific 3D Printer designed for very specific applications. This printer is not recommended for novices, and is not suitable for everyday, hobbyist 3D printing applications. If you are interested in a 3D Printer for beginners, prototyping, engineering or manufacturing strong and durable end use parts, rather look at the Duplicator 6 3D Printer. UV Cured resins generally are not of very high strength, therefore this is not suitable for manufacturing prototypes or end use parts. The Duplicator 7 will be suitable for 3D printing high resolution sculptures, arts and jewelry pieces. Certain resins are compatible with the lost wax casting process.